[prMac.com] Frankfurt, Germany - Eltima Software, with its team of leaders in USB and Serial port sharing, has just released new version of its revolutionary FlexiHub program for Mac OS X. 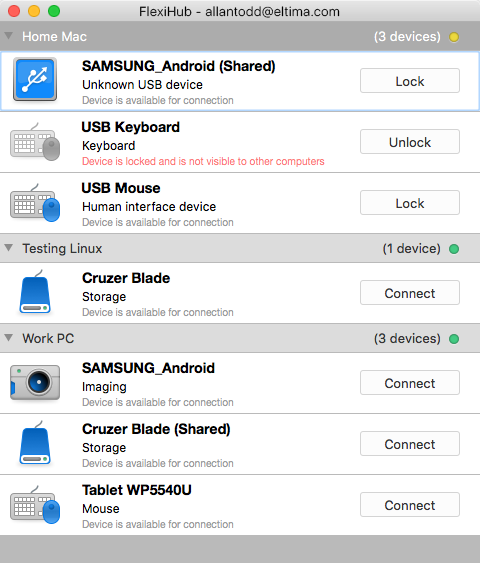 Featuring a simple and comrehensive Mac style interface, FlexiHub is a software program for sharing of USB and Serial (COM) ports over network. It doesn't matter where shared ports with devices are, they can be across the road, in the same room, or across the globe - they are easily shared and are accessible from any spot of the globe. FlexiHub allows efficient management of remote devices, connection and disconnection are held without user's physical presence at the USB or Serial port. All shared connections are transmitted through secured SSL protocol and can go through FlexiHub's own redirection server to ensure the most efficient connecion. There are actually three types of connection to choose from: LAN, UDP, and the redirection server. To start working with FlexiHub, a user has to register their account, which helps protecting shared connections and keep them within one account accessible only to specific people. FlexiHub uses 256-bit SSL encryption. Such secure connection cannot be intercepted and no one can get to its data. FlexiHub says NO to data loss. FlexiHub is all you need even if you are working on a Mac and need to debug colleague's software that is connected to their Linux or Windows machine. Connect to printers and scanners shared from your Linux-oriented office from your Mac and manage them as if they were connected to it directly. One of the common problems of software sharing of USB or COM ports is heavy traffic that overloads network and may destabilize it. FlexiHub got it covered by its unique technology of traffic compression. It helps unload network when certain devices send uncompressed data. Depending on user's needs, there is a choice between better speed or better compression rate. FlexiHub offers four subscription options - one of them is free, others are paid. Free subscription allows sharing one port and using software on two nodes (computers) with a limitation of 20 minutes per session. Paid subscriptions allow sharing multiple devices among multiple nodes (computers) for unlimited periods of time. Users can use FlexiHub's own redirection server and automatic reconnection in case connection with a shared device is interrupted. Subscribing for one year of FlexiHub saves you 18% compared to subscribing for a shorter period of time. Eltima Software is a global software Development Company, specializing primarily in serial communication, mobile and flash software for Mac OS and Windows. Eltima Software delivers top-notch solutions having a friendly team of 40 professionals. Copyright (C) 2015 Eltima Software. All Rights Reserved. Apple, the Apple logo and Macintosh are registered trademarks of Apple Inc. in the U.S. and/or other countries.